‘Yeungnam University Journal of Medicine (YUJM)’ issued by YU Medical School (dean Kim Jong-yeon) was selected as the ‘registered journal’ from 2018 Academic Journal Evaluation by Korea Research Foundation. YUJM was third to be selected as ‘registered journal’ of Korea Research Foundation, after Yonsei Medical School and Chonnam Medical School, out of academic journals from 41 medical schools in the nation. Through this, YUJM was recognized as an excellent academic journal equipped with a system and composition as a comprehensive medical journal. 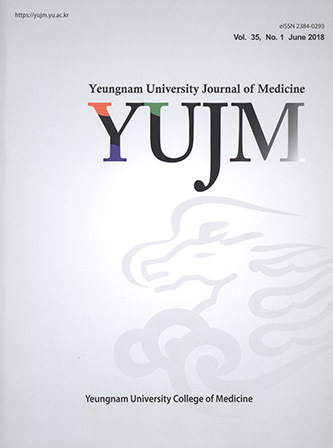 YUJM was established in 1984 and it has been issuing reviews articles of fundamental and clinical medicine, original articles, and case reports twice a year (June 30th and December 31st). Scripts are received as non-scheduled admissions through the online essay contest system on the official website (https://yujm.yu.ac.kr). YUJM provides full-texts of academic journals that meet the international standards after it was registered in KoreaMed in 2004 and also in KoreaMed Synapse in 2013, and it was also selected as a candidate for a registered academic journal of Korea Research Foundation. YUJM can be searched through domestic medicine databases such as KISS or KMbase, and a development plan will be made and implemented with the aim of registering a domestically and internationally prominent cited index database such as PubMed, EMBASE, SCOPUS, and SCI(E).